"Justification by faith" redirects here. For other uses, see Justification (theology). Sola fide (Latin: by faith alone), also known as justification by faith alone, is a Christian theological doctrine that distinguishes most Protestant denominations from the Catholic Church, the Eastern Orthodox Church, and some parts of the Restoration Movement. The doctrine of sola fide asserts God's pardon for guilty sinners is granted to and received through faith alone, excluding all "works". All mankind, it is asserted, is fallen and sinful, under the curse of God, and incapable of saving itself from God's wrath and curse. But God, on the basis of the life, death, and resurrection of his Son, Jesus Christ alone (solus Christus), grants sinners judicial pardon, or justification, which is received solely through faith. Faith is seen as passive, merely receiving Christ and all his benefits, among which benefits are the active and passive righteousness of Jesus Christ. Christ's righteousness, according to the followers of "sola fide," is imputed (or attributed) by God to the believing sinner (as opposed to infused or imparted), so that the divine verdict and pardon of the believing sinner is based not upon anything in the sinner, nor even faith itself, but upon Jesus Christ and his righteousness alone, which are received through faith alone. Justification is by faith alone and is distinguished from the other graces of salvation. See the Protestant ordo salutis for more detail on the doctrine of salvation considered more broadly than justification by faith alone. Historic Protestantism (both Lutheran and Reformed) has held to sola-fide justification in opposition to Roman Catholicism especially, but also in opposition to significant aspects of Eastern Orthodoxy. Protestants exclude all human works (except the works of Jesus Christ, which form the basis of justification) from the legal verdict (or pardon) of justification. In the General Council of Trent the Catholic Church stated in canon XIV on justification that "If any one saith, that man is truly absolved from his sins and justified, because that he assuredly believed himself absolved and justified; or, that no one is truly justified but he who believes himself justified; and that, by this faith alone, absolution and justification are effected; let him be anathema (excommunicated)." Thus, "faith alone" is foundational to Protestantism, and distinguishes it from other Christian denominations. According to Martin Luther, justification by faith alone is the article on which the church stands or falls. Christian theologies answer questions about the nature, function, and meaning of justification quite differently. These issues include: Is justification an event occurring instantaneously or is it an ongoing process? Is justification effected by divine action alone (monergism), by divine and human action together (synergism), or by human action? Is justification permanent or can it be lost? What is the relationship of justification to sanctification, the process whereby sinners become righteous and are enabled by the Holy Spirit to live lives pleasing to God? From 1510 to 1520, Luther lectured on the Psalms and the books of Hebrews, Romans, and Galatians. As he studied these portions of the Bible, he came to view the use of terms such as penance and righteousness by the Roman Catholic Church in new ways. (See Romans 4:1-5, Galatians 3:1-7, and Genesis 15:6.) He became convinced that the church was corrupt in its ways and had lost sight of what he saw as several of the central truths of Christianity, the most important of which, for Luther, was the doctrine of justification—God's act of declaring a sinner righteous—by faith alone through God's grace. He began to teach that salvation or redemption is a gift of God's grace, attainable only through faith in Jesus. "This one and firm rock, which we call the doctrine of justification," insisted Martin Luther, "is the chief article of the whole Christian doctrine, which comprehends the understanding of all godliness." He also called this doctrine the articulus stantis et cadentis ecclesiae ("article of the standing and falling of the church"): "…if this article stands, the Church stands; if it falls, the Church falls." Lutherans follow Luther in this when they call this doctrine "the material principle" of theology in relation to the Bible, which is "the formal principle." They believe justification by grace alone through faith alone in Christ's righteousness alone is the gospel, the core of the Christian faith around which all other Christian doctrines are centered and based. Traditionally, Lutherans have taught forensic (or legal) justification, a divine verdict of acquittal pronounced on the believing sinner. God declares the sinner to be "not guilty" because Christ has taken his place, living a perfect life according to God's law and suffering for his sins. For Lutherans, justification is in no way dependent upon the thoughts, words, and deeds of those justified through faith alone in Christ. The new obedience that the justified sinner renders to God through sanctification follows justification as a consequence, but is not part of justification. For Lutherans, justification provides the power by which Christians can grow in holiness. Such improvement comes about in the believer only after he has become a new creation in Christ through Holy Baptism. This improvement is not completed in this life: Christians are always "saint and sinner at the same time" (simul iustus et peccator)—saints because they are holy in God's eyes, for Christ's sake, and do works that please him; sinners because they continue to sin until death. Paul is writing to people who said that faith in Jesus alone does not save a person, but one has to also obey God's law in order to be justified (Gal 3:3, 5:4). To counter the false idea that what we do in keeping the law must be added to faith in what Christ did for us. Paul often emphasizes in his letters (esp. Galatians, Romans, Colossians) that we are saved by grace through faith alone. James is writing to people who felt that believing in Jesus saved a person, but that having faith did not mean that a person necessarily would keep God's commandments out of love for God (James 2:14, 17). To show that faith is not really faith unless it leads a person to thank God for salvation in a life of glad and willing obedience to God's holy will. James emphasized that a faith which did not show that it was living faith was really not faith at all. Martin Luther elevated sola fide to the principal cause of the Protestant Reformation, the rallying cry of the Protestant cause, and the chief distinction between Protestant Christianity and Roman Catholicism. John Calvin, also a proponent of this doctrine, taught that "every one who would obtain the righteousness of Christ must renounce his own." According to Calvin, it is only because the sinner is able to obtain the good standing of the Son of God, through faith in him, and union with him, that sinners have any hope of pardon from, acceptance by, and peace with God. While this precise terminology—"by faith alone"—does not appear in English Bible translations other than in James 2:24 where it has been claimed that the author seems to reject the notion that a person is justified by God solely on account of faith, other Catholic authorities also used "alone" in their translation of Romans 3:28 or exegesis of salvation by faith passages, and it is claimed to summarize the teaching of the New Testament, and especially the Pauline epistles such as Romans 4, which systematically reject the proposition that justification before God is obtained due to the merit of one's obedience to the Law of Moses (see also Biblical law in Christianity), or Abraham's circumcision and works. The position that justification is by faith alone has often been charged with promoting antinomianism, in which salvific faith need not be a type that will produce works of obedience to Christ, which is a view most who hold to sola fide reject, invoking many authorities from the past and present in concurrence. This debate, therefore, is not over the question of whether God renews us and initiates a process of gradual growth in holiness throughout the course of our lives. ‘We are justified by faith alone, but not by a faith that is alone,’ Luther stated, and this recurring affirmation of the new birth and sanctification as necessarily linked to justification leads one to wonder how the caricatures continue to be perpetuated without foundation. The doctrine proposes that faith in Christ is sufficient for sinners to be accepted by God, to count them among his people, and to equip them with the motive of trust, gratitude, and love toward God from which good works are to be done. Some Christian groups such as Catholics believe that faith is necessary for salvation but not sufficient; that is, they assert that sola fide is an error because, in addition to believing, God also requires obedience and acts of love and charity as a prerequisite for acceptance into his kingdom, and for the reward of eternal life. This is in line with the traditional view of faith as faithfulness [to God] in the Old Testament. See also Christian view of the Old Testament Law. The precise relationship between faith and good works remains as an area of controversy in some Protestant traditions (see also Law and Gospel). Even at the outset of the Reformation, subtle differences of emphasis appeared. For example, because the Epistle of James emphasizes the importance of good works, Martin Luther sometimes referred to it as the "epistle of straw." Calvin on the other hand, while not intending to differ with Luther, described good works as a consequence or 'fruit' of faith. The Anabaptists tended to make a nominal distinction between faith and obedience. Recent meetings of scholars and clergy have attempted to soften the antithesis between Protestant and Catholic conceptions of the role of faith in salvation, which, if they were successful, would have far reaching implications for the relationship between most Protestants and the Catholic Church. These attempts to form a consensus are not widely accepted among either Protestants or Catholics, so sola fide continues to be a doctrinal distinctive of the Reformation churches, including Lutherans, Reformed, and many Evangelicals. Nevertheless, some statements of the doctrine are interpreted as a denial of the doctrine as understood by other groups. There is a semantic component to this debate as well, which has gained new attention in the past century. Both Latin and English have two words to describe convictions: one is more intellectual (English belief, Latin verb credo) and one carries implications of "faithfulness" (English faith, Latin fides). But Greek and German have only one (German Glaube, Greek pistis). Some historians have suggested that this semantic issue caused some of the disagreement: Perhaps Luther's supporters may have understood "salvation by faith alone" to mean "salvation by being faithful to Christ," while his opponents understood him to mean "salvation by intellectual belief in Christ." Since there are passages in Luther's works that could be taken to support either of these meanings, both sides were able to quote passages from Luther defending their interpretation of what he meant. Various Biblical passages have been used to support and oppose the doctrine of sola fide. Genesis 15:6: Abram believed the Lord, and he credited it to him as righteousness. Isaiah 55:1: Come, all you who are thirsty, come to the waters; and you who have no money, come, buy and eat! Come, buy wine and milk without money and without cost. Matthew 7:22-23: Many will say to me in that day, 'Lord, Lord, have we not prophesied in thy name? and in thy name have cast out devils? and in thy name done many wonderful works?' And then will I profess unto them, I never knew you: depart from me, ye that work iniquity. Luke 5:20: And when he saw their faith, he said unto them, Man, thy sins are forgiven thee. Luke 18:10-14: Two men went up to the temple to pray, one a Pharisee and the other a tax collector. The Pharisee stood up and prayed about himself: 'God, I thank you that I am not like other men—robbers, evildoers, adulterers—or even like this tax collector. I fast twice a week and give a tenth of all I get.' But the tax collector stood at a distance. He would not even look up to heaven, but beat his breast and said, 'God, have mercy on me, a sinner.' I tell you that this man, rather than the other, went home justified before God. John 3:16: For God so loved the world, that He gave His only begotten Son, so that whoever believes in Him shall not perish, but have eternal life. John 3:18: Whoever believes in him is not condemned, but whoever does not believe stands condemned already because he has not believed in the name of God's one and only Son. John 5:24: Verily, verily, I say unto you, He that heareth my word, and believeth him that sent me, hath everlasting life, and shall not come into condemnation; but is passed from death unto life. John 6:40: And this is the will of him that sent me, that every one which seeth the Son, and believeth on him, may have everlasting life, and I will raise him up at the last day. Acts 10:43: Of Him all the prophets bear witness that through His name everyone who believes in Him receives forgiveness of sins. Acts 16:31: Believe on the Lord Jesus Christ, and you shall be saved. John 14:6: Jesus saith unto him, I am the way, the truth, and the life: no man cometh to the Father, but by me. Romans 1:17-18: Therefore the just shall live by faith. The wrath of God is indeed being revealed from heaven against every impiety and wickedness of those who suppress the truth by their wickedness. Romans 10:9: That if thou shalt confess with thy mouth the Lord Jesus, and shalt believe in thine heart that God hath raised him from the dead, thou shalt be saved. Romans 14:23: ...for whatsoever is not of faith is sin. Corinthians 1:21: For since, in the wisdom of God, the world through wisdom did not know God, it pleased God through the foolishness of the message preached to save those who believe. Galatians 3:1-3; Galatians 3:9-14; Galatians 3:21-25: O foolish Galatians, who hath bewitched you, that ye should not obey the truth, before whose eyes Jesus Christ hath been evidently set forth, crucified among you? This only would I learn of you, Receive ye the Spirit by the works of the law, or by hearing of faith? Are you so foolish? having begun in the Spirit, are ye now made perfect by the flesh? ... So then they which be of faith are blessed with faithful Abraham. For as many as are of the works of the law are under the curse: for it is written, Cursed is every one that continueth not in all things which are written in the book of the law to do them. But that no man is justified by the law in the sight of God, it is evident: for, The just shall live by faith. And the law is not of faith: but, The man that doeth them shall live in them. Christ hath redeemed us from the curse of the law, being made a curse for us: for it is written, Cursed is every one that hangeth on a tree. That the blessing of Abraham might come on the Gentiles through Jesus Christ; so that we might receive the promise of the Spirit through faith.... Is the law then against the promises of God? God forbid: for if there had been a law given which could have given life, verily righteousness should have been by the law. But the Scripture hath concluded all under sin, that the promise by faith of Jesus Christ might be given to them that believe. But before faith came, we were kept under the law, shut up unto the faith which should afterwards be revealed. Wherefore the law was our schoolmaster to bring us unto Christ, that we might be justified by faith. But after that faith is come, we are no longer under a schoolmaster. Galatians 5:4-5: Christ is become of no effect unto you, whosoever of you are justified by the law; ye are fallen from grace. For we through the Spirit wait for the hope of righteousness by faith. Ephesians 1:13-14: In Him you also trusted, after you heard the word of truth, the gospel of your salvation; in whom also, having believed, you were sealed with the Holy Spirit of promise, who is the guarantee of our inheritance until the redemption of the purchased possession, to the praise of His glory. Ephesians 2:8-10: For by grace are ye saved through faith; and that not of yourselves: it is the gift of God: Not of works, lest any man should boast. For we are his workmanship, created in Christ Jesus unto good works, which God hath before ordained that we should walk in them. Philippians 3:9: And be found in him, not having mine own righteousness, which is of the law, but that which is through the faith of Christ, the righteousness which is of God by faith. 1 Timothy 1:16: However, for this reason I obtained mercy, that in me first Jesus Christ might show all long suffering, as a pattern to those who are going to believe on Him for everlasting life. Psalms 15: A Psalm of David. O LORD, who may abide in Your tent? Who may dwell on Your holy hill? He who walks with integrity, and works righteousness, And speaks truth in his heart. He does not slander with his tongue, Nor does evil to his neighbor, Nor takes up a reproach against his friend; In whose eyes a reprobate is despised, But who honors those who fear the LORD; He swears to his own hurt and does not change; He does not put out his money at interest, Nor does he take a bribe against the innocent. He who does these things will never be shaken. Psalms 106:28-31: They yoked themselves to the Baal of Peor and ate sacrifices offered to lifeless gods; they aroused the Lord’s anger by their wicked deeds, and a plague broke out among them. But Phinehas stood up and intervened, and the plague was checked. This was credited to him as righteousness for endless generations to come. Matthew 7:21: (part of the Sermon on the Mount): "Not everyone who says to me, 'Lord, Lord,' will enter the kingdom of heaven, but only he who does the will of my Father who is in heaven." Matthew 7:24-27: (part of the Sermon on the Mount): "Therefore everyone who hears these words of mine and puts them into practice is like a wise man who built his house on the rock. The rain came down, the streams rose, and the winds blew and beat against that house; yet it did not fall, because it had its foundation on the rock. But everyone who hears these words of mine and does not put them into practice is like a foolish man who built his house on sand. The rain came down, the streams rose, and the winds blew and beat against that house, and it fell with a great crash." Matthew 12:36-37: "I tell you, on the day of judgment you will have to give an account for every careless word you utter; For by your words you will be justified, and by your words you will be condemned." Matthew 16:27: "For the Son of Man is going to come in his Father's glory with his angels, and then he will reward each person according to what he has done." Matthew 21:28-31: "‘But what do you think? A certain man had two sons, and he came to the first and said: "Son, go work today in my vineyard." He answered: "I will not," but afterwards he repented and went. So he came to the second and said likewise, and he answered and said: "I go, sir," but did not go. Which of the two has done the will of his father?’ They said to him: ‘The first.’ Jesus said to them: ‘Verily, I say to you: The publicans and the harlots go into the kingdom of God before you.’"
Matthew 24:10-20: (part of the Olivet discourse): "Then many will fall away, and they will betray one another and hate one another. And many false prophets will arise and lead many astray. And because of the increase of lawlessness, the love of many will grow cold. But the one who endures to the end will be saved." Matthew 25:31-46: (part of The Sheep and the Goats): "When the Son of Man comes in his glory, and all the angels with him, he will sit on his throne in heavenly glory. All the nations will be gathered before him, and he will separate the people one from another as a shepherd separates the sheep from the goats. He will put the sheep on his right and the goats on his left. Then the King will say to those on his right, 'Come, you who are blessed by my Father; take your inheritance, the kingdom prepared for you since the creation of the world. For I was hungry and you gave me something to eat, I was thirsty and you gave me something to drink, I was a stranger and you invited me in, I needed clothes and you clothed me, I was sick and you looked after me, I was in prison and you came to visit me.' Then the righteous will answer him, 'Lord, when did we see you hungry and feed you, or thirsty and give you something to drink? When did we see you a stranger and invite you in, or needing clothes and clothe you? When did we see you sick or in prison and go to visit you?' The King will reply, 'I tell you the truth, whatever you did for one of the least of these brothers of mine, you did for me.' Then he will say to those on his left, 'Depart from me, you who are cursed, into the eternal fire prepared for the devil and his angels. For I was hungry and you gave me nothing to eat, I was thirsty and you gave me nothing to drink, I was a stranger and you did not invite me in, I needed clothes and you did not clothe me, I was sick and in prison and you did not look after me.' They also will answer, 'Lord, when did we see you hungry or thirsty or a stranger or needing clothes or sick or in prison, and did not help you?' He will reply, 'I tell you the truth, whatever you did not do for one of the least of these, you did not do for me.' Then they will go away to eternal punishment, but the righteous to eternal life." Matthew 28:19-20a: (part of the Great Commission): "Therefore go and make disciples of all nations, baptizing them in the name of the Father and of the Son and of the Holy Spirit, and teaching them to obey everything I have commanded you." Luke 8:21: "But He answered and said to them, 'My mother and My brothers are these who hear the word of God and do it.' "
Luke 10:25-28: "On one occasion an expert in the law stood up to test Jesus. 'Teacher,' he asked, 'what must I do to inherit eternal life?' 'What is written in the Law?' he replied. 'How do you read it?' He answered: 'Love the Lord your God with all your heart and with all your soul and with all your strength and with all your mind'; and, 'Love your neighbor as yourself.' 'You have answered correctly,' Jesus replied. 'Do this and you will live.'" John 5:29: "And will come out, those who have done good, to the resurrection of life, and those who have done evil, to the resurrection of condemnation." Acts 26:20: "First to those in Damascus, then to those in Jerusalem and in all Judea, and to the Gentiles also, I preached that they should repent and turn to God and prove their repentance by their deeds." Romans 2:6-16: For he will render to every man according to his works: to those who by patience in well-doing seek for glory and honor and immortality, he will give eternal life; but for those who are factious and do not obey the truth, but obey wickedness, there will be wrath and fury. There will be tribulation and distress for every human being who does evil, the Jew first and also the Greek, but glory and honor and peace for every one who does good, the Jew first and also the Greek. For God shows no partiality. All who have sinned without the law will also perish without the law, and all who have sinned under the law will be judged by the law. For it is not the hearers of the law who are righteous before God, but the doers of the law who will be justified. When Gentiles who have not the law do by nature what the law requires, they are a law to themselves, even though they do not have the law. They show that what the law requires is written on their hearts, while their conscience also bears witness and their conflicting thoughts accuse or perhaps excuse them on that day when, according to my gospel, God judges the secrets of men by Christ Jesus. Galatians 6:7b-9: "A man reaps what he sows. The one who sows to please his sinful nature, from that nature will reap destruction; the one who sows to please the Spirit, from the Spirit will reap eternal life. Let us not become weary in doing good, for at the proper time we will reap a harvest if we do not give up." 1 Corinthians 6:9-10: "Do you not know that the unrighteous shall not inherit the kingdom of God? Be not deceived: neither fornicators, nor idolaters, nor adulterers, nor effeminate, nor abusers of themselves with mankind; nor thieves, nor covetous, nor drunkards, nor revilers, nor extortioners, shall inherit the kingdom of God." 1 Corinthians 7:19: "Circumcision means nothing and uncircumcision means nothing; what matters is keeping God's commandments." 1 Corinthians 13:2-3: "And if I have prophetic powers, and understand all mysteries and all knowledge, and if I have all faith, so as to remove mountains, but do not have love, I am nothing. If I give away all my possessions, and if I hand over my body so that I may boast, but do not have love, I gain nothing." 1 Corinthians 13:13: "And now faith, hope, and love abide, these three; and the greatest of these is love." 2 Corinthians 5:10: "For we must all appear before the judgement seat of Christ; that every one may receive the things done is his body, according to that he hath done, whether it be good or bad." Philippians 2:12b-13: "Work out your salvation with fear and trembling, For God is one who, for his good purpose, works in you both to desire and to work." 1 Timothy 4:16: "Attend to yourself and to your teaching; persevere in both tasks, for by doing so you will save both yourself and those who listen to you." 1 Timothy 6:18-19: "That they do good, that they be rich in good works, ready to distribute, willing to communicate; Laying up in store for themselves a good foundation against the time to come, that they may lay hold on eternal life." Hebrews 10:24: "And let us consider how we may spur one another on toward love and good deeds." James 1:22: "Do not merely listen to the word, and so deceive yourselves. Do what it says." James 2:14-26: What does it profit, my brethren, if someone says he has faith but does not have works? Can faith save him? If a brother or sister is naked and destitute of daily food, and one of you says to them, “Depart in peace, be warmed and filled,” but you do not give them the things which are needed for the body, what does it profit? Thus also faith by itself, if it does not have works, is dead. But someone will say, “You have faith, and I have works.” Show me your faith without your works, and I will show you my faith by my works. You believe that there is one God. You do well. Even the demons believe—and tremble! But do you want to know, O foolish man, that faith without works is dead? Was not Abraham our father justified by works when he offered Isaac his son on the altar? Do you see that faith was working together with his works, and by works faith was made perfect? And the Scripture was fulfilled which says, “Abraham believed God, and it was accounted to him for righteousness.” And he was called the friend of God. You see then that a man is justified by works, and not by faith only. Likewise, was not Rahab the harlot also justified by works when she received the messengers and sent them out another way? For as the body without the spirit is dead, so faith without works is dead also. 1 Peter 1:17: "Now if you invoke as Father him who judges impartially according to each one's works, conduct yourselves with reverence during the time of your sojourning." 1 Peter 2:12: "Having your conversation honest among the Gentiles: that, whereas they speak against you as evildoers, they may by your good works, which they shall behold, glorify God in the day of visitation." 1 John 2:3-7: "We know that we have come to know him if we obey his commands. The man who says, 'I know him,' but does not do what he commands is a liar, and the truth is not in him. But if anyone obeys his word, God's love is truly made complete in him. This is how we know we are in him: Whoever claims to live in him must walk as Jesus did. Dear friends, I am not writing you a new command but an old one, which you have had since the beginning. This old command is the message you have heard." 1 John 3:17-18: "If anyone has material possessions and sees a brother or sister in need but has no pity on them, how can the love of God be in that person? Dear children, let us not love with words or speech but with actions and in truth." Revelation 2:23: "Then all the churches will know that I am he who searches hearts and minds, and I will repay each of you according to your deeds." Revelation 14:12-13: "Here is a call for the endurance of the saints, those who keep the commandments of God and hold fast to the faith of Jesus. And I heard a voice from heaven saying, ‘Write this: Blessed are the dead who from now on die in the Lord.’ ‘Yes,’ says the Spirit, ‘they will rest from their labours, for their deeds follow them.’"
Revelation 20:13: "All the dead were judged according to their deeds." Revelation 22:12-15: "Behold, I am coming soon. I bring with me the recompense I will give to each according to his deeds. I am Alpha and Omega, the beginning and the end, the first and the last. Blessed are they who do his commandments, that they may have right to the tree of life, and may enter through the gates into the city. For without are dogs, sorcerers, whoremongers, murderers, idolaters, and whosoever loves and makes a lie." Many Catholics see the exclusion of "works of the law" as only referring to works done for salvation under the Mosaic law, versus works of faith which are held as meritorious for salvation. Adherents of sola fide respond that Jesus was not instituting keeping a higher moral code as means of salvation, and tend to see the exclusion of "works of the law" (as the means of obtaining justification) as referring to any works of the Mosaic law, and by implication, any "works of righteousness which we have done" (Titus 3:5) or any system in which one earns eternal life on the basis of the merit of works. However, most understand that the "righteousness of the law" is to be fulfilled by those who are justified by faith (Romans 8:4). The Mosaic law and the principles of the Gospel (such as the Sermon on the Mount and the Last Judgment of Matthew 25) are seen as being in correspondence, with the latter fulfilling, clarifying, and expanding on the former, centering on God's love for us, and love to others. Thus a Protestant believer can claim that "the law is holy, and the commandment holy, and just, and good," (Romans 7:12) harmonizing the two principles of the same Bible. “God justifies by faith alone.” (Deus ex sola fide justificat). For Scripture says that faith has saved us. Put better: Since God willed it, faith has saved us. Now in what case, tell me, does faith save without itself doing anything at all? Faith’s workings themselves are a gift of God, lest anyone should boast. What then is Paul saying? Not that God has forbidden works but that he has forbidden us to be justified by works. No one, Paul says, is justified by works, precisely in order that the grace and benevolence of God may become apparent. If Abraham was not justified by works, how was he justified? … Abraham believed God, and it was reckoned to him as righteousness (Rom. 4:3; Gen. 15:6). Abraham, then, was justified by faith. Paul and James do not contradict each other: good works follow justification. Although it can be said that God’s commandments pertain to faith alone, if it is not dead [faith], but rather understood as that live faith, which works through love. For we are justified by faith, not by works of the law, as Scripture says (Gal. 2:16). By faith in whom, then, are we justified? Is it not in him who suffered death according to the flesh for our sake? Is it not in one Lord Jesus Christ? Therefore the hope of justification is not found in them [the moral and ceremonial requirements of the law], but in faith alone, Rom 3:28: We consider a human being to be justified by faith, without the works of the law. The Catholic view excludes sola fide as the sole grounds for justification, holding instead that grace, specifically, the form of grace known as "sanctifying grace", and which first floods the soul at baptism, which empowers both one's ability to believe and perform good works, is essential as the gateway to salvation, but not the only element needed for salvation (Eph 2:8-10). God's freely given grace is offered and also empowers both one's ability to believe and perform good works, both then becoming meritorious because they are joined to Christ's saving power of the Cross. (Phil 2:12-13) (Catechism of the Catholic Church, 1987-2029) A Christian must respond to this free gift of Grace from God given first, ordinarily, in Baptism (1 Pet 3:21) by both having faith and by living in the light of Christ through love (Jn 3:16; 1 Jn 1:7)(Galatians 5:6)which perfects the Christian throughout their life (James 2:22). The Catholic position is best summed up in John 3:16, if one has the proper, contextual understanding of the word "believe". "Believe", in context and in ancient Judaism, meant more than an intellectual assent. "To believe" also meant to obey, which is seen, in context, in Jn 3:36, 1 Jn 2:3ff, and 1 Jn 5:1ff. Without our positive response to grace offered, salvation is not possible. As expounded in the Catechism of the Catholic Church, the Catholic Church's teaching is that it is the grace of God, "the free and undeserved help that God gives us to respond to his call", that justifies us, a grace that is a prerequisite for our free response of "collaboration in justification through faith, and in sanctification through charity", "With regard to God, there is no strict right to any merit on the part of man", so that "we can have merit in God's sight only because of God's free plan to associate man with the work of his grace. Merit is to be ascribed in the first place to the grace of God, and secondly to man's collaboration. Man's merit is due to God." "No one can merit the initial grace which is at the origin of conversion. Moved by the Holy Spirit, we can merit for ourselves and for others all the graces needed to attain eternal life, as well as necessary temporal goods." According to the Catechism of the Catholic Church justification is conferred in baptism, the sacrament of faith. The sacrament of reconciliation enables recovery of justification, if lost through committing a mortal sin. A mortal sin makes justification lost, even if faith is still present. The Council of Trent sought to clarify the Catholic Church's teaching on justification and the manner in which it differed from that proposed by Protestants. It stated: "Faith is the beginning of human salvation, the foundation and root of all justification, without which it is impossible to please God (Hebrews) and to come to the fellowship of His sons; and we are therefore said to be justified gratuitously, because none of those things that precede justification, whether faith or works, merit the grace of justification." "Faith, unless hope and charity be added to it, neither unites man perfectly with Christ nor makes him a living member of His body. For which reason it is most truly said that faith without works is dead (James 2:17-20) and of no profit, and in Christ Jesus neither circumcision availeth anything nor uncircumcision, but faith that worketh by charity (Galatians 5:6)." After being justified, "to those who work well unto the end and trust in God, eternal life is to be offered, both as a grace mercifully promised to the sons of God through Christ Jesus, and as a reward promised by God himself, to be faithfully given to their good works and merits. ... Since Christ Jesus Himself, as the head into the members and the vine into the branches (John 15:1-6), continually infuses strength into those justified, which strength always precedes, accompanies and follows their good works, and without which they could not in any manner be pleasing and meritorious before God, we must believe that nothing further is wanting to those justified to prevent them from being considered to have, by those very works which have been done in God, fully satisfied the divine law according to the state of this life and to have truly merited eternal life, to be obtained in its [due] time, provided they depart [this life] in grace". the good works of the one justified are in such manner the gifts of God that they are not also the good merits of him justified; or the one justified by the good works that he performs by the grace of God and the merit of Jesus Christ, whose living member he is, does not truly merit an increase of grace, eternal life, and in case he dies in grace, the attainment of eternal life itself and also an increase of glory (canon 32). 1) Protestants have devised many and varied explanations to neutralize the clear and unambiguous statement in Jm 2:24 that “man is justified by works and not by faith alone.” Each of these explanations concludes that James is not teaching that man is justified by works in the same sense that Paul says man is justified by faith. Puzzled by James’s language, Martin Luther even concluded that the epistle of James was a spurious book and should not be canonically authoritative for New Testament teaching. 2) Countering the Protestant explanation of the epistle of James which states that James means that “men” witness Abraham’s works, the Genesis text (Genesis 22) does not include any men as witness to Abraham’s works, but only God himself. a) If James were teaching a concept of “vindication,” he would have said, with the proper Greek word, “you see, a person is vindicated by works.” Moreover, since James adds the clause “and not by faith alone” we know that he is correcting a false notion concerning the solitude of faith in justification, not suggesting that Abraham was vindicated by works. b) If James were attempting to teach a vindication of Abraham, the specific argumentation he used would make sense only if James’s opponents had claimed that Abraham was “vindicated by faith alone.” In other words, if the vindication hypothesis were true, syntactical requirements would have forced James to use the meaning of “vindicated” in the first part of his argument (Jm 2:20-21) in order also to use it in the latter part (Jm 2:24). Since the grammatical structure of the verse would then require that the phrase “not by faith alone” have its referent in the phrase “is vindicated,” this would force the meaning of the verse to be, “a person is vindicated...not by faith alone” — a meaning that has no relevance to James’s discussion. c) The New Testament does not use the word “justified” in the sense of "vindicated" in contexts which are soteriological, i.e., contexts which discuss salvation or damnation. Moreover, such passages as Mt 11:19 where one could plausibly interpret the Greek word dikaioo as referring to a vindication do so only in a metaphorical sense; therefore they do not use dikaioo in the same way that James, and even Paul, use the term, which is historical and literal. d) James’s discussion of the events surrounding the justification of Rahab preclude assigning the meaning of “vindicated” to the word justified. Rahab’s justification, as described in Jm 2:25, is a salvific justification, not a vindication, yet James specifies that Rahab was justified “in the same way” that Abraham was justified. Therefore, one cannot understand Abraham’s justification as a vindication. e) Since James and Paul use the same Greek noun dikaiosune (“righteous”) in reference to Abraham, and interpret the word in the same way (cf. Gn 15:6, Rm 4:3, Jm 2:23), it would be totally incongruous for one of them to use a different meaning of its verbal cognate dikaioo in reference to Abraham. f) The Protestant position assumes that Abraham’s justification is a once-for-all event. James’s all important question “Can faith save him?” (Jm 2:14), however, includes Abraham within its purview. Hence we must conclude that if Abraham’s works were not of the quality that James prescribes in the context (Jm 2:15), then Abraham would not be justified. Abraham could not be justified in a “once-for-all” event in Gn 15:6 and at the same time have that justification put in jeopardy by disobedience to James’s requirement of works for justification. If this could happen, the question in Jm 2:14 would have no meaning. 4) Abraham’s acts in Genesis 12, 15, and 22 were acts of faith and works. We should not misconstrue Paul’s stress on Abraham’s faith in his view of Gn 15:6 to say that Abraham performed no works of loving obedience to God at this time or prior, nor should we misconstrue James’s view of works in Genesis 22 to say that Abraham’s attempted sacrifice of Isaac was not a supreme act of faith. Similarly, Abraham’s departure from his homeland in Genesis 12 also couples his faith and works in regard to justification. Throughout his life, in the periods recorded in Genesis 13-14, 16-21, and 23-25 which are between the times of his recorded faith and obedience in the New Testament, Abraham continued to live in faith and obedience, with only what we may call minor lapses along the way. Genesis 22's importance is its detailing of Abraham’s quintessential act of the faith-and-works which allowed God to swear an oath of blessing to him and for all his future descendants. Abraham’s act in Genesis 22, not Gn 15:6, was the most important act in Abraham’s life. The act in Genesis 22 was just as much a crediting of righteousness to Abraham as that in Gn 15:6. 5) The entire context of the book of James concerns what one must do to be saved. He concentrates on obedience to the law as the means of salvation, and judgment for those who disobey that law. 6) James includes sins of commission as well as omission in his warning against disobedience to the law. The supreme law, or “royal law,” that James has in view is the law of love. 7) James assumes that the audience to whom he writes already has faith in God. The main question that James poses to them is whether they have added works to their faith. James does not suggest that works will immediately or inevitably flow from one who has faith, even though he may have a greater disposition towards good works once he has faith. James teaches that one who has faith must make a daily, conscious decision to do good works, just as he must decide each day to refrain from sin. In fact, if he chooses not to do good works when the opportunity arises, he has sinned (Jm 4:17). 8) James does not support the Protestant concept that one can be saved as long as he has “saving faith.” James is not so much attempting to qualify the faith needed for justification as he is saying that one must consciously add works to faith in order to be justified. A person, to be justified, must persevere to his last breath in this conscious decision to add works to faith. 9) One of the most heinous in the catalogue of sins that James specifies is sin of the tongue. What is “said” to God and man is of the utmost importance to James and a major criterion on how the individual will be judged. 10) Both Paul and James speak of the works of love that one must add to his faith in order to be justified. 11) Like Paul, James concludes that if one chooses the system of law and desires God to evaluate him on that basis without the benefit of grace, he must then obey the whole law without fault. For one fault, the law will utterly condemn him. Faith is necessary to salvation unconditionally. Good works are necessary only conditionally, that is if there is time and opportunity. The thief on the cross in Luke 23:39-43 is Wesley's example of this. He believed in Christ and was told, "Truly I tell you, today you will be with me in Paradise." This would be impossible if the good works that are the fruit of genuine repentance and faith were unconditionally necessary for salvation. The man was dying and lacked time; his movements were confined and he lacked opportunity. In his case, faith alone was necessary. However, for the vast majority of human beings good works are necessary for continuance in faith because those persons have both the time and opportunity for them. Bishop Jones concludes that "United Methodist doctrine thus understands true, saving faith to be the kind that, give time and opportunity, will result in good works. Any supposed faith that does not in fact lead to such behaviors is not genuine, saving faith." Furthermore, while "faith is essential for a meaningful relationship with God, our relationship with God also takes shape through our care for people, the community, and creation itself." Whereas in Lutheran theology the central doctrine and focus of all our worship and life is justification by grace through faith, for Methodists the central focus has always been holy living and the striving for perfection. Wesley gave the analogy of a house. He said repentance is the porch. Faith is the door. But holy living is the house itself. Holy living is true religion. “Salvation is like a house. To get into the house you first have to get on the porch (repentance) and then you have to go through the door (faith). But the house itself--one’s relationship with God--is holiness, holy living” (Joyner, paraphrasing Wesley, 3). Our churches by common consent...teach that men cannot be justified before God by their own strength, merits, or works, but are freely justified for Christ's sake, through faith, when they believe that they are received into favor, and that their sins are forgiven for Christ's sake, who, by His death, has made satisfaction for our sins. This faith God imputes for righteousness in His sight. Rom. 3 and 4. That those which have union with Christ, are justified from all their sins, past, present, and to come, by the blood of Christ; which justification we conceive to be a gracious and free acquittance of a guilty, sinful creature, from all sin by God, through the satisfaction that Christ hath made by his death; and this applied in the manifestation of it through faith. Chapter XI of the London Baptist Confession of Faith 1689 is the same as the Westminster Confession of Faith. A typical Anabaptist confession of faith. Salvation is variously expressed, sometimes as "justification by faith," in which case it means that the just person has accepted the offer of a covenantal relationship, and lives according to that covenant. In fact, if we had to appear before God relying—no matter how little—on ourselves or some other creature, then, alas, we would be swallowed up. Question 86: Since then we are delivered from our misery, merely of grace, through Christ, without any merit of ours, why must we still do good works? Question 87: Cannot they then be saved, who, continuing in their wicked and ungrateful lives, are not converted to God? The New Testament makes it clear that the gift of salvation is received through faith. "By grace you have been saved through faith; and this is not your own doing, it is the gift of God" (Ephesians 2:8). By faith, which is also the gift of God, we repent of our sins and freely adhere to the gospel, the good news of God's saving work for us in Christ. By our response of faith to Christ, we enter into the blessings promised by the gospel. Faith is not merely intellectual assent but an act of the whole persons involving the mind, the will, and the affections, issuing in a changed life. We understand that what we here affirm is in agreement with what the Reformation traditions have meant by justification by faith alone (sola fide). 25. We confess together that sinners are justified by faith in the saving action of God in Christ. By the action of the Holy Spirit in Baptism, they are granted the gift of salvation, which lays the basis for the whole Christian life. They place their trust in God's gracious promise by justifying faith, which includes hope in God and love for him. Such a faith is active in love and thus the Christian cannot and should not remain without works. But whatever in the justified precedes or follows the free gift of faith is neither the basis of justification nor merits it. 5. Regarding the way in which salvation is appropriated by the believers, Lutherans, by teaching that justification and salvation are by grace alone through faith (sola gratia, sola fide), stress the absolute priority of divine grace in salvation. When they speak about saving faith they do not think of the dead faith which even the demons have (cf. James 2:19), but the faith which Abraham showed and which was reckoned to him as righteousness (cf. Gen. 15:6, Rom. 4:3,9). The Orthodox also affirm the absolute priority of divine grace. They underline that it is God's grace which enables our human will to conform to the divine will (cf. Phil 2:13) in the steps of Jesus praying, "not as I will but as You will" (Matthew 26:39), so that we may work out our salvation in fear and trembling (cf. Phil. 2:12). This is what the Orthodox mean by "synergy" (working together) of divine grace and the human will of the believer in the appropriation of the divine life in Christ. The understanding of synergy in salvation is helped by the fact that the human will in the one person of Christ was not abolished when the human nature was united in Him with the divine nature, according to the Christological decisions of the Ecumenical Councils. While Lutherans do not use the concept of synergy, they recognize the personal responsibility of the human being in the acceptance or refusal of divine grace through faith, and in the growth of faith and obedience to God. Lutherans and Orthodox both understand good works as the fruits and manifestations of the believer's faith and not as a means of salvation. ↑ "Preface to Romans by Martin Luther". ↑ "Augsburg Confession - Book of Concord". ↑ John 3:16,36, Galatians 2:16, Romans 4:20-25, 2 Timothy 1:12 speak of trust, confidence, and belief in Christ. John 3:18 notes belief in the name of Christ, and Mark 1:15 notes belief in the gospel. ↑ "Errors of Catholicism - Wisconsin Evangelical Lutheran Synod (WELS)". ↑ "Welcome to WELS". Archived from the original on 6 June 2014. ↑ Meier, Edward P. (1978), The Nature of True Faith: An Exegesis of James 2, p8, Wisconsin Lutheran Seminary, saying: "James talks as if he were from Missouri, “Show me!” He says to the objector, “I can show you faith by my works.” His works proved that his faith was active. But can the objector show faith without works? James knew what Matthew had said in the seventh chapter, “Ye shall know them by their fruits.”"
↑ "History of the Christian Church, book 7, chapter 4". 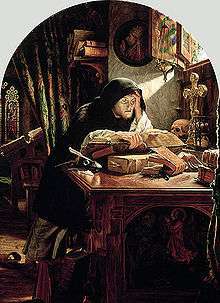 ; Philip Schaff's The Protestant Spirit of Luther’s Version: "The most important example of dogmatic influence in Luther’s version is the famous interpolation of the word alone in Romans 3:28 (allein durch den Glauben), by which he intended to emphasize his solifidian doctrine of justification, on the plea that the German idiom required the insertion for the sake of clearness. But he thereby brought Paul into direct verbal conflict with James, who says (James 2:24), "by works a man is justified, and not only by faith" ("nicht durch den Glauben allein"). It is well known that Luther deemed it impossible to harmonize the two apostles in this article, and characterized the Epistle of James as an "epistle of straw," because it had no evangelical character ("keine evangelische Art")." 1 2 3 "Luther Added The Word "Alone" to Romans 3:28". beggarsallreformation.blogspot.com. ↑ "The Monstrosity of a Faith that is Alone". Defending. Contending. ↑ "Are we justified by faith alone?". mountainretreatorg.net. ↑ "Is salvation by keeping the law?". ↑ Clement Alexandria. Epistle to the Corinthians. ↑ Justin Martyr. Dialogue with Trypho. ↑ Didymus the Blind. Commentary on James, 2:26b. ↑ Jerome. Epistolam Ad Romanos. Caput X, v. 3, PL 30:692D. ↑ Chrysostom. Homily on Ephesians. 4.2.9. ↑ Augustine. Expositions of the Psalms 1-32. Exposition 2 of Psalm 31. ↑ Catechism of the Catholic Church No. 1992. Vatican City-State. Justification is conferred in Baptism, the sacrament of faith. ↑ Catechism of the Catholic Church No. 1446. The Vatican. Christ instituted the sacrament of Penance for all sinful members of his Church: above all for those who, since Baptism, have fallen into grave sin, and have thus lost their baptismal grace and wounded ecclesial communion. It is to them that the sacrament of Penance offers a new possibility to convert and to recover the grace of justification. The Fathers of the Church present this sacrament as "the second plank [of salvation] after the shipwreck which is the loss of grace." 1 2 3 4 "Paul III Council of Trent-6". ↑ Sungenis, Robert A. (1997). Not By Faith Alone The Biblical Evidence for the Catholic Doctrine of Justification. Santa Barbra, CA: Queenship Publishing. pp. 172–175. ISBN 1-57918-008-6. ↑ Joyner, F. Belton (2007). United Methodist Answers. Westminster John Knox Press. p. 80. ISBN 9780664230395. Jacob Albright, founder of the movement that led to the Evangelical Church flow in The United Methodist Church, got into trouble with some of his Lutheran, Reformed, and Mennonite neighbors because he insisted that salvation not only involved ritual but meant a change of heart, a different way of living. 1 2 Jones, Scott J. (2002). United Methodist Doctrine. Abingdon Press. p. 190. ISBN 9780687034857. ↑ Bucher, Richard P. (2014). "Methodism". Lexington: Lutheran Church Missouri Synod. ↑ "Salvation: Grace, Justification, and Synergy". 9th Plenary of the Lutheran-Orthodox Joint Commission. Sigtuna: helsinki.fi. 7 August 1998. Look up credo, fides, Glaube, or πίστις in Wiktionary, the free dictionary.